Istvan & His Imaginary Band. Winner of a 2016 Parents’ Choice Fun Stuff Award! 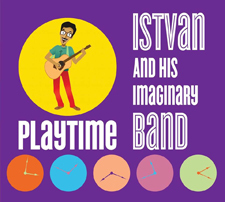 Playtime is the fun, clever and colorful new full length children’s record from Istvan & His Imaginary Band. “I’ve been exploring new sounds which are on full display on this long overdue album. With more time to work on songs this time around and felt like I could focus on instruments I hadn’t used before like piano, clavinet and farfisa. I’ve always loved synth sounds so I found perfect places to add some Moog which makes really happy.